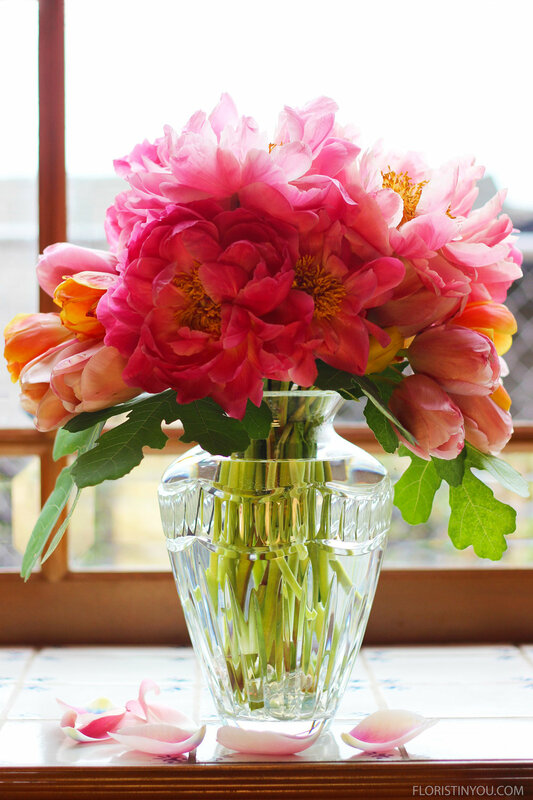 The peonies have arrived. I didn't know it and as I walked into my neighborhood Trader Joe's store, they grabbed me by the legs screaming, "Buy me, I'm so beautiful". The tulips are lovely too, so I bought a bunch of French tulips and a bunch of variegated with hot pinks and oranges. They are combined with fig leaves I cut from my backyard in a neoclassical Marquis Waterford crystal vase. The tulips are used to elongate the arrangement on each side, and the fig leaves continue the line at about a 45 degree angle. Well if you see Peonies at the store I'm sure they will scream "Buy me!" to you too. Once you succumb, get some tulips while you are buying, cut some fig leaves and you're ready to make this arrangement. Fill with water up to widest part of vase. Carefully add 2 handfuls of clear flat marbles. Pull off all leaves below water line. 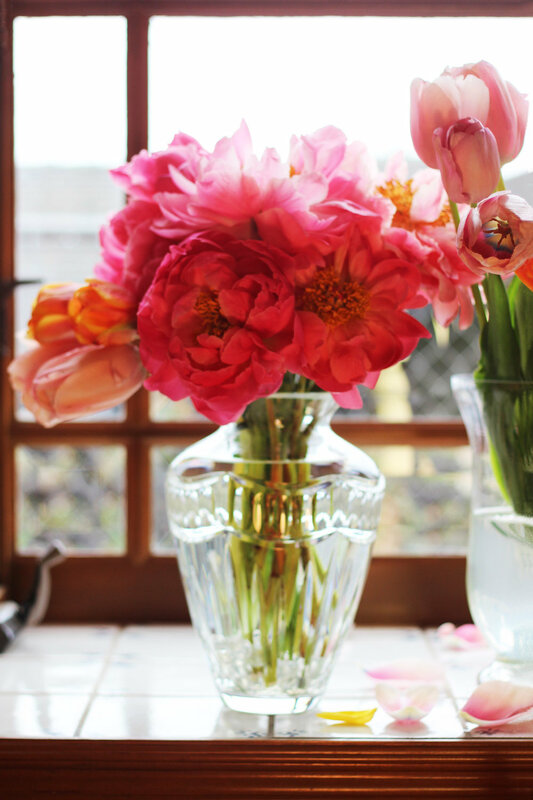 Put peonies on left and right of lower center peony. (Cut them 13.5 inches) Repeat for back. Now extend tulips on the right. Add fig leaves on same angle on left. The flowers look like a painting. I would imagine Georgia O'Keefe would have loved to paint them. Now you are done. Enjoy these beautiies.